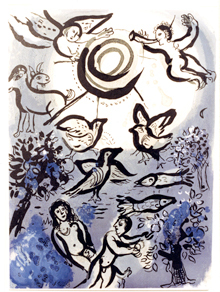 Marc Chagall's lithograph "Bible II-Creation" is part of the exhibit "God Spoke the Earth: Stories of Genesis in Prints and Drawings," opening Sept. 12. Emory's Creation Stories project forms the framework for a year of events at the Michael C. Carlos Museum. The arts and sciences at Emory will be in the spotlight with museum exhibitions, gallery tours, the book club, children's activities and talks. One of the most exciting finds and the showpiece of an exhibition at the Carlos is an ancient tablet that tells the story of a great flood. Dating from the 17th century BC, the tablet was discovered in the ruins of the ancient Babylonian city of Nippur in the 19th century by a team from the University of Pennsylvania, whose Museum of Archaeology and Anthropology is loaning it to the Carlos to highlight programming and research focused on ancient biblical sources. The Nippur Tablet went on view Aug. 30 and will remain through July 26, 2015. Written in Sumerian, it recounts the story of a plan by the gods to destroy the world via a great flood and how an immortal man named Utnapishti builds a huge boat to rescue his family and every type of animal. Also under the theme of Creation, a works on paper exhibition, "God Spoke the Earth: Stories of Genesis in Prints and Drawings," will be on view Sept. 12 through Dec. 7 at the Carlos. Works of art, including Albrecht Dürer's famed 1504 engraving, "Adam and Eve (The Fall of Man)," and Marc Chagall's lithograph "Bible II-Creation" will explore the stories of Genesis from the first days of creation through the fall of man and more. Other works on view will be drawn from the permanent collections of the Pitts Theology Library and the Manuscript, Archive, and Rare Books Library (MARBL) as well as the Carlos. Several talks and a symposium on the creation theme will complement the exhibitions. Joel M. LeMon, associate professor of Old Testament at Candler School of Theology, will use the "God Spoke the Earth" works to discuss major narratives and themes in the Book of Genesis in a gallery talk, "Walking Through Genesis." The talk will be Tuesday, Sept. 30, at 7:30 p.m. in the Carlos' Works on Paper Gallery. Because of limited space, a reservation is required; call 404-727-6118. This walking tour "will explore how these artists read and re-imagined the text of Genesis, placing the characters of Genesis within a rich visual world," LeMon says. At the heart of these stories are compelling—and often tragic—characters: Adam and Eve, Abraham and Sarah, Joseph and his brothers. "Genesis describes how language began, how people started to eat meat, how people learned to make wine," he says. "Taken as a whole, Genesis describes how communities came into existence: how they first came into conflict with one another and how they might relate to a creating God." John D. Dunne, associate professor of religion in Emory College of Arts and Sciences, will examine how alternative modes of world making are articulated in Buddhist art, thought and practice. "Delusion or Compassion? World-Making in Buddhist Philosophy, Practice and Art" will be Tuesday, Oct. 7, at 7:30 p.m. in the Reception Hall of the museum. A symposium, "Nippur to Noah: Stories of the Flood," will take place Oct. 18 from 2 p.m. to 5 p.m. in the Carlos Reception Hall. "The year-long loan of the Nippur flood tablet has inspired [the] symposium," according to Carlos Museum director Bonnie Speed, "featuring faculty from the Candler School of Theology and alumni of Emory's Graduate Division of Religion discussing the significance of the flood accounts." Marko Geslani in the Department of Religion will lead a discussion of how in late-Vedic understanding, sacrifice was deeply implicated in the process of creation. "Sacrifice as Creation" will be Tuesday, Nov. 11, at 7:30 p.m. in the Carlos Reception Hall. Music will figure into the theme of creation with a concert by the Vega String Quartet on Saturday, Nov. 22, at 8 p.m. in the Emerson Concert Hall of the Schwartz Center for Performing Arts. Emory's quartet-in-residence will play a piece by Joseph Haydn, the creator of the string quartet. The world premiere of a new work by Paul Salerni and Milhaud's "Creation of the World" with William Ransom on piano will also be performed. Creation will also be the theme at the Carlos Reads Book Club for this academic year. Three of the book clubs are already sold out and not taking any more reservations. Still open are "Thomas Mann's Joseph and His Brothers" and "Hesiod's Theogony." "Thomas Mann's Joseph and His Brothers" will be Mondays, Sept. 29, Oct. 27, Nov. 17 and Dec. 8. The book is linked to 12 watercolors in the God Spoke the Earth: Stories of Genesis in Prints and Drawings exhibition. They are by American artist Joan Wadell-Barnes who was commissioned to illustrate an American edition of the book. Erdmann Waniek, associate professor emeritus of German Studies, will guide readers in a discussion of John E. Woods' 2005 translation. There is a fee of $75 for Carlos Museum members; $100 for non-members, and includes the cost of the book. Registration is required by calling 404-727-6118. "Hesiod's Theogony" will be on Monday, Dec. 1. Peter Bing, Samuel Candler Dobbs Professor of Classics, will lead readers through the creation epic by Hesiod, an 8th/7th century B.C. poet. The cost is $25 for Carlos Museum members; $35 for non-members, and includes the cost of the book. Registration is required by calling 404-727-6118. "Different cultures view creation so very differently, and the Year of Creation allows us to ponder those varying perspectives. In ancient Greece, for instance, the epic poet Hesiod conceived of creation in terms of 'family,' with the cosmos unfolding like a gigantic family tree, and relationships appearing in terms of inherited traits and family resemblance,” Bing says. Emory has formed a partnership with the Atlanta Symphony Orchestra and the Georgia Council for the Humanities to produce this year of events under the Creation theme. "We at the Carlos Museum are very excited about participating in the Creation Year Project," Speed says. "These are only a few of the programs we are offering, and a full listing can be found on the Carlos Museum's website."